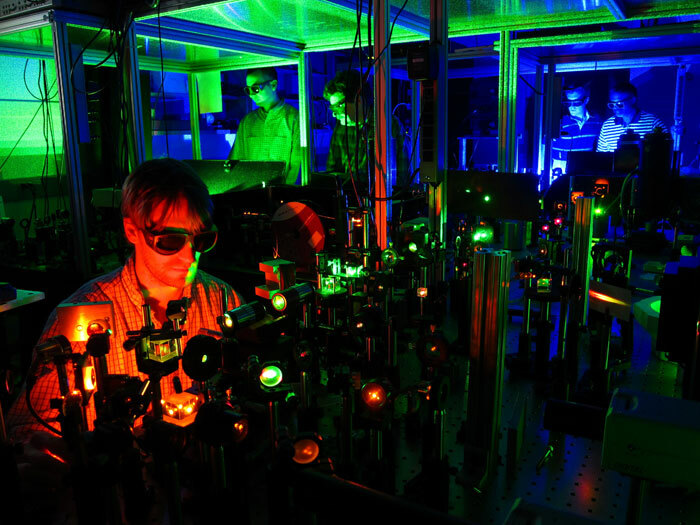 The optical spectroscopy facilities include custom-built laser micro-optical systems for precise work in diamond-anvil cells at high pressure. These include Spectra Physics 165 and 171 Ar and Kr lasers, Coherent 90 and 305 Ar lasers, Spex 1877 spectrographs, a Dilor XY spectrograph, three HRS-460 spectrographys, two HR-3320 spectrographys, and small spectrometers for blackbody and ruby fluorescence measurements (for pressure determination), all equipped with microscope optics for diamond-cell sampling. The spectrographs are equipped with Princeton Instruments and Dilor optical diode array detectors. We have several liquid-nitrogen cooled CCD detectors, which are extremely important for detecting low signal levels (e.g., from small samples). We also have four liquid helium cryostats with capabilities to 2 K. Most recently we have obtained a 200 MHz Bruker NMR facility together with a custom-built high-pressure probe for in situ NMR studies (to >10 GPa). This complements the 200 MHz system in our department that can be used for studies of pressure-quenched samples). Fig. 1. 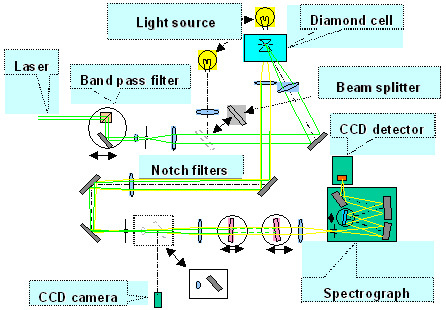 Optical layout of the Raman system capable of performing ultrahigh pressures measurements in opaque (e.g., metal) samples. Raman/fluorescence systems (Fig. 1) in our Washington DC located group and at the NSLS are used routinely for ruby fluorescence measurements, ultra-high pressure Raman measurements at ambient conditions, ultra-high pressure Raman measurements at low (L-He) temperatures, and high temperatures (to 1000-1100K). The excitation wavelength can be varied from 457 nm (Ar ion laser) to 950 nm (Ti-sapphire laser). This facility has proven to be extremely efficient and is operating in multi-user arrangement.